Lower left back pain is a condition that affects many people – young and old. Very often, lower back pain affects just one side of your body and can cause discomfort ranging from mild aches to agonizing sharp pain. Lower back pain is also called lumbago because it causes discomfort in your lumbar region or lower back. This is the area in your lower back that is above your hips and below the bottom of your back rib cage. Muscle injury, nerve damage, or problems with internal organs can all result in pain in the lower left back side. Lower left back pain may also cause other painful symptoms on the left-hand side of your body. For example, if pinched nerves are causing you pain in your lower left back, you might have a tingling sensation or shooting pains down your left leg. However, it can be difficult to diagnose the exact cause of lower back pain on the left side. Kidney infections and kidney stones can cause pain that radiates to your left lower back or right back. Also, many women experience back pain in their left lumbar region because of problems with their reproductive system. In this article, you will learn about various causes of lower left back pain. You will also find out what to do if you suffer from aches and pains in your left back area below your ribcage. Conditions that result in back pain on your lower left side can also be associated with symptoms that can cause discomfort in other parts of your body. Along with lower back pain, you might have pain that is felt in your groin or lower abdominal area. According to the National Institute of Neurological Disorders and Stroke, lower back pain that just affects one side of your back can be caused by infection or inflammation in your internal organs. 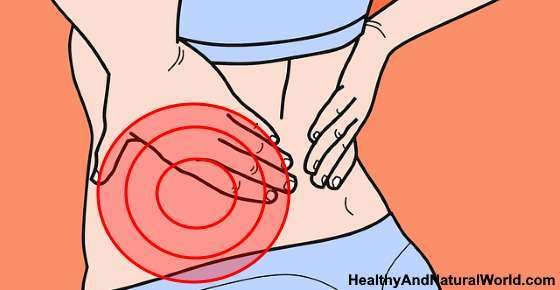 This can cause the pain to be so severe that it is crippling.2 Along with the back pain, you might have a burning sensation when you urinate, lower abdominal cramping pain, and cloudy urine. You may also have signs of a fever and feel nauseous. Many women experience more lower left back pain than men because of issues with their menstrual cycle. For example, pregnancy can put more strain on the lower back and cause pain on both the left side and right side of the back. Or conditions like endometriosis, ovarian cysts, or uterine fibroids can result in mild to severe aches in the lower left back along with irregularities in the menstrual cycle and irregular vaginal bleeding. Let’s look at the various reasons why you can feel pain in your lower left back and what you can do to treat the back pain at home. Injury to the joints, ligaments, muscles, and tendons in your left lumbar area can cause lower back pain on the left-hand side. Your lower back plays an important role in helping to support your upper body and ensure smooth body movement so that you can walk or run properly. After 2 days of ice treatment, you should use a heat pack to speed up the healing process and ease pain in your lower left back. You can find instructions on how to use a heat back for back pain at the end of this article. Muscle strain is another type of injury that can cause left-sided lower back pain and affect your daily activities. The resulting pain from the lower back injury can be mild to severe, depending on the extent of strain to the muscles, tendons, or ligaments of the lower back. To treat acute and chronic back pain, you can find some useful ideas in my article on how to get rid of muscle soreness. You should also try to improve your posture to prevent back pain causing discomfort in your daily activities. Your sciatic nerve runs from your lower back area down the length of each leg. Usually, sciatica only affects one side of your body, so if your left sciatic nerve is irritated or pinched, you will have lower left back pain. The best way to treat sciatica naturally is to do gentle exercises to help improve movement and reduce nerve irritation. You can also use heat packs to help get rid of the sciatic pain. For more helpful advice on treating sciatica naturally at home, please read my articles on yoga stretches for sciatic pain, how to use a foam roller for sciatica, and how to use a tennis ball for sciatic pain relief. You will experience severe sharp lower left back pain if a disc in your spine bulges or ruptures. Spinal discs are small jelly-like discs that help support your spine and act as shock absorbers. If a disc in your spine herniates it can irritate surrounding nerves and cause pain, numbness, or weakness. This can happen due to wear and tear or through injury. One way to prevent a disc in your back or neck rupturing is to regularly exercise to strengthen your back muscles. It is also important to keep a good posture, which can also be a cause of lower back pain on the left side. Poor posture while sitting or standing can result in lower back pain that just affects one side of your body. Not standing correctly or sitting properly can put extra strain on your lower back and cause muscles and tendons to stiffen up and become sore. Poor posture can also cause a pars defect: a crack or fracture in a small connecting bone in your lower spine. There are many helpful exercises to improve posture by strengthening your neck muscles, relaxing your shoulders, and strengthening your core muscles. Ankylosing spondylitis is an inflammatory condition of the spine that can cause pain and stiffness in your lower back. The back pain that ankylosing spondylitis causes happens when vertebrae in your spine fuse together and restricts movement in your back. Ankylosing spondylitis is usually treated by relieving inflammation and pain in the affected area. Physical therapy is also useful in slowing the progression of the condition and help improve sleep patterns by reducing pain during the nighttime. Arthritis that affects your lumbar region will usually cause varying degrees of lower back pain on the left side or right side, depending on where the arthritis is. Lower left back and groin pain can be severe when there are problems with your sacroiliac joint (SI joint). The sacroiliac joint is at the base of your spine and connects your spine to your pelvic bone. Inflammation, arthritis, or damage to your SI joint can all cause irritation and pain in your lumbar region. Heat treatment remedies are great to relieve pain on the left side of your lower back and can help to ease discomfort caused by sacroiliac joint dysfunction. Osteoporosis that affects the left side of your back can cause a great deal of pain and discomfort in that area. Osteoporosis happens when bone structure and strength get reduced and causes bones to become brittle. This can cause bones to easily fracture and break and be one of the many reasons for pain in the lower back. There are many ways to prevent osteoporosis naturally. For example, consuming foods that are rich in calcium can strengthen bones and make them stronger. Also, vitamin D is important to prevent brittle bones and many other health complications. Sometimes, dull aches or sharp pains in your lower left back can be caused by problems with organs in your abdominal area. The lower left part of your back includes the left kidney, which is located towards your back, just below the rib cage. Part of your stomach, intestines, and colon are also located on the left side of your abdomen and, usually, if you have any digestive problems, the digestive-related pain may also to be felt on the lower left side of your back. Women also have part of their reproductive system on the left side of their body. For example, ovarian cyst on the left ovary can also be a source of pain in women in the lower part of their back. Your kidneys are located in your middle back and an infection in your left kidney can be a cause of left-hand sided lower back pain. Kidney infections are caused when bacteria get into your urinary system and make their way to your kidneys. This results in inflammation and can make urination painful. In order to look after the health of your kidneys, you should avoid these common habits that damage your kidneys and drink plenty of fluids to flush out toxins from your kidneys and urinary system. Another problem with your kidneys that can cause flank pain or lower back pain on one side of your body is kidney stones. These are small deposits of minerals and salts that build up to form tiny stones. Even though the stones can be tiny, they can cause excruciating pain that travels from your middle back to one side on your lower back and then to your groin. Doctors from the Mayo Clinic describe what the pain of kidney stones feels like. The pain can come and go in waves starting from your back or side just below your ribs. When the kidney stone moves, it can cause pain in the groin and lower abdomen and you may notice that it is painful to pee. Drinking apple cider vinegar is an effective way to dissolve kidney stones naturally and stop them from causing back pain and pelvic pain. Your pancreas is found on the left side of your abdomen and inflammation in the small organ can be a cause of lower left back pain. Your pancreas is essential for keeping your digestive system healthy. If for some reason your pancreas becomes inflamed you may also have upper abdominal pain that radiates to your back and possibly nausea and vomiting with a fever. There are some natural ways to help treat the first symptoms of a urinary tract infection. For example, drinking baking soda water can be helpful to neutralize the acid in your urine and reduce irritation in your urinary tract. Sometimes lower back pain that affects your left side can be a result of digestive upset or a chronic digestive condition. Ulcerative colitis is an inflammatory digestive condition that can cause lower left back pain. It is not known what causes ulcerative colitis, but a sufferer will have inflammation in small areas of the colon that causes diarrhea after eating and possibly blood in stools. As well as causing lower abdominal pain, irritable bowel syndrome can also be to blame for backaches. However, IBS usually causes digestive upset like diarrhea, constipation, and greasy stools. IBS is a difficult gastrointestinal condition to manage. However, some natural remedies for IBS include taking peppermint capsules to calm your lower intestines, following the low FODMAP diet, and trying to eliminate stress as much as you can. To help manage the painful discomfort that diverticulitis causes, eating a high fiber diet and drinking warm water, as well as taking digestive enzymes and probiotic supplements can treat the symptoms of diverticulitis. Many women experience pain in the left side of their back as part of their regular menstrual cycle or due to one or more conditions of the reproductive organs. Other signs of cysts on your ovaries include spotting before your period, abdominal and pelvic cramping that isn’t connected with your period, and irregular monthly cycles. Other causes of lower left back pain during pregnancy include stress, weight gain, and pain in the abdominal muscles can also cause pelvic pain in women. To get rid of back pain during pregnancy, Dr. Pagano recommends heat treatment on the lower back area to help ease discomfort and make moving around easier. Usually, a heat pad can help to relieve cramping in abdomen and pain in the lower back that endometriosis causes. Apart from the many causes of back pain that affects the lower left part of your back, there are some other reasons for the discomfort. Fibromyalgia is a chronic condition that causes muscle pain in the body. Fibromyalgia suffers can experience acute pain in their lower back that only lasts a short time or the back pain can be chronic and affect their quality of life. Some essential oils are great for easing muscle pain caused by fibromyalgia and can also reduce inflammation. You can also find helpful information in my article on managing chronic fatigue and fibromyalgia naturally with this natural supplement. Shingles affects the nerves in your body and can cause lower left back pain if your left back has been affected by this viral infection. You can treat lower left back pain caused by shingle using Manuka and clover honey, or try these essential oils. One of the best ways to treat lower left back pain or pain on the right side of your lower back is to apply a heat pad. Heat helps to increase blood circulation to the sore muscles and ligaments to speed up the healing process. This type of pain-relief treatment for lower left back pain can be used to relieve back pain caused by strained muscles, inflammation of internal organs, or back pain associated with a woman’s menstrual cycle. For information on when to use cold or heat pack for muscle strain and injury, please read my article on using cold and heat therapy for muscle pain and stiff joints. Fill a clean sock with rice or another dry grain leaving enough room to tie it at the top. Place the sock in a microwave and heat for 2 minutes on full power. Dip a clean washcloth in hot water and wring out the excess. Wrap the heat pad in the warm moist towel as that will help the heat penetrate your skin easier. Place on the left side of your lower back and hold there for 20 minutes to help ease the pain and reduce muscle and joint stiffness. Repeat 3-4 times a day until all signs of pain in your lower left back have gone. Diagnosing the underlying cause of lower left back pain can be a challenge. Therefore, if you have back pain that lasts for more than 2 days and you can’t get relief using home remedies for back pain, you should see a doctor. Lower back pain or middle back pain accompanied by a fever. Trauma to your back that causes pain that lasts for more than a few days and doesn’t get better. Numbness in your legs or constant tingling feeling down one or both legs. Loss of bowel or bladder function as a result of a herniated disc, spinal stenosis, or fracture to the spine. Lower back pain on either side of your body that interferes with your daily activities or sleep. Lower back pain that becomes chronic and last for longer than 6 weeks. WebMD. A visual guide to low back pain. NINDS. Low back pain fact sheet. BMJ. Global burden of low back pain. WebMD. Is your SI joint giving you back pain? WebMD. What are the symptoms of UITs? WebMD. Back pain during pregnancy. UCSFHealth. Fibroids signs and symptoms. WebMD. Try heat or ice. WebMD. When to see a doctor for back pain.